Jenna Coleman will leave Doctor Who after the next season, which begins airing in the U.K. on Saturday. The Hollywood Reporter says Coleman will take the lead in Victoria, an upcoming drama from ITV Studios, where she will portray Queen Victoria from the age of 18 as she ascends to the throne. Coleman has been Doctor Who’s companion for three years, playing Clara Oswald alongside two different Doctors, actors Matt Smith and Peter Capaldi. She told Radio 1 Breakfast show host Nick Grimshaw it had been “emotional” leaving the show and filming her last scenes as Clara Oswald with current Doctor Peter Capaldi. “It’s been in the works for a very long time,” she said, “[Writer] Steven [Moffat] and I sat down a year and a half ago and tried to work out the best place to do it and tell a really good story. Jenna Coleman and Matt Smith. This entry was posted in Like Show Business and tagged Doctor Who, Jenna Coleman, Matt Smith, Peter Capaldi by Mike Glyer. Bookmark the permalink. Too bad. I know it isn’t popular, but I like her. Perhaps Clara could spear the doctor through both hearts and take his tardis…becoming the master. I like Coleman fine as an actor, but Clara is hands down the worst companion in NuWho history. I’m not sad. Coming after the Amy-Rory double team, Clara was always going to have a hard job. I liked her though. Granted that Amy/Rory are my favorite companions period, followed by Donna. They did Clara no favors by making her not a character at all, but recycled bits of Amy Pond’s premise plus Doctor-focus. But problems with Clara’s first season are probably inseparable from the general awfulness of the scripts that year. Matt Smith’s charm was the only thing keeping the show going by that point. She’ll make a good Victoria, I think. “Bails” is an odd word to use. At the end of this season, Jenna Coleman will have had a very long tenure, for a companion, especially in the new series: compare Billie Piper, who had two years, or Catherine Tate, who had only one. It’s pretty normal for the actor who plays a companion to move on after a while. I think companions are the ultimate Rorschach test. I personally couldn’t really stand the dynamic between Edward and Bella and Jacob – uh, between Matt Smith’s Doctor, Pond, and Rory of course! Can’t understand how possibly those two triads got mixed up in my head…(1) But again, that is me. But again, Rorschach test – some people loathed Donna, some loved her. Some thought Rose was the one true companion, there is a Martha Jones faction. I think you can divide Clara into Smith-Clara and Capaldi-Clara. Smith-Clara was part of that snoozer of the season, with only a few high points. Definitely was Pond recycled. On the other hand, I thought the middle stretch of this last season had some real high points, and I really liked the Danny Pink/Clara interaction. I really _liked_ seeing the companion’s life when it wasn’t entirely doctor centric. Capaldi-Clara is definitely in the upper half for me. Thought that could be because the character development took her out of the “woman whose who life revolves around the Doctor” trope that she was the fourth incarnation of. If there’s anything this year has taught us, people will have very different view of what X is, even within a large fandom, and the thing is go with it. I’m eager to see the next Companion, because part of Who is seeing who the next one will be. I spent most of last season hoping it was Pink. We may be at the point to switch show runners too; but time will tell. (1) Seriously, fold River Song in and it maps directly. “Bails” is an odd word to use. I thought it deserved a little FUD because of the dramatic choice in making the announcement the night before the new season begins. And what a crackup — now there’s a Doctor Who publicity photo showing Capaldi, Coleman, and a pair of Daleks in the Abbey Road crosswalk, and many are drawing the parallel with rumors inspired by the Beatles’ original. With Jenna playing the part of Sir Paul McCartney, the attention to detail is INCREDIBLE – she’s even gone barefoot, so cue the ‘Jenna is dead’ conspiracy theories after she confirmed she had filmed her final scenes. I found Donna super-annoying. I did like Rose a lot. She and Martha are my favorite companions, I think. But I don’t hate Clara and I think Jenna Coleman is certainly very pretty. I liked her as an actress in Death Comes to Pemberley and I do think she’s a good match for Queen Vicky. Meanwhile, on the level of detail in the Beatles/Doctor pictures, Coleman has the proper foot forward, but Capaldi does not. So much for detail. All the women here are over Dr. Who finally, long after I couldn’t be bothered with it anymore. Jenna Coleman was the only reason to watch the last bunch of episodes, because she was the prettiest and most vivacious actress they ever had. OK, call me sexist. Did one of the old Dr. Who producers say they had pretty companions on “for the dads”? Jenna Coleman was definitely ” for the dads”. 1. Donna: because she was a very effective foil for the Doctor. Turn Left is one of my favorite Doctor Who episodes and one of the few companion-centric episodes. Overall there was a good combination of Tate’s perfoamnce, effective scripts and a good dynamic between her and Tennant. 2. 50% Clara: Coleman I think initially had the same problem that Freema Agyeman had – the writers didn’t know what to do with the character. The later Clara who is bossy to the point of obnoxiousness is a better character, although I should imagine opinions on that will be as varied as opinions on Capaldi’s first season. 3. Rose: Apart from being the first of the NuWho, Rose worked well because of the depth of her own supporting cast. That same trick didn’t work for Martha Jones or even Donna but for Rose it did. 4. Rory-Amy: Likeable and central to much of the Matt Smith story arc. It was good for Amy to be a double-act with Rory. 5. Martha Jones: Some excellent acting but badly served by scripts and storylines. The worst role for the companion is to simply be tagging along after the Doctor and too often this was what Jones had to do. While that season had some of the best Who episodes (Blink, Human Nature/Family of Blood) Jones never got a really strong episode centered on her (the closest being the second part of the two part finale). Additionally that season was the worst one for Russell T Davies’s indulgent tendency to portray the Doctor as a quasi-divine savior. I won’t rank River Song in that list as it was a different role from the ‘companion’ one. However, recently re-watched her introduction/finale in the Tennant era and it demonstrates how Moffat’s clever-tricksy tendencies worked well with Davies’s emotional sledgehammer tendencies to make very good television. Anyway – sad to see Coleman go. I hope there is an episode in this new series set in Blackpool (Coleman’s and Clara’s home town) as it is natural setting for Who and a place that should be appreciated by anybody who loves weird. My all time ( from any point in time ) favorite companion always has been and always will be K-9, followed by Sarah Jane Smith. 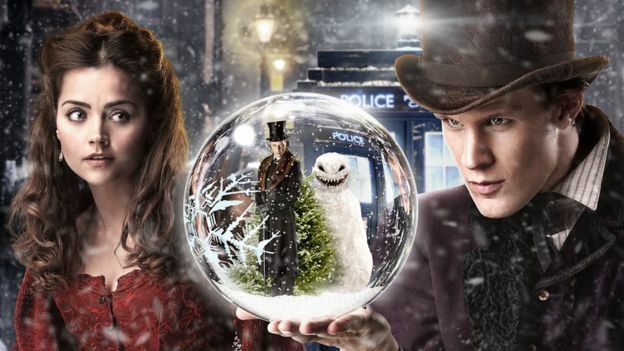 It was announced last year (in the run up to the christmas special) that the christmas special would be her last apperance on doctor who as a fake out to make it seem like she would be killed off permenantly in the last christmas episode. I am still annoyed at what happened to Donna in her last episode. Grrrr. I thought Clara was a MUCH more interesting character with Capaldi than with Smith. @Charles Stewart: Egads! I am gobsmacked at your parallel. Amazing. Now I’ve just time for a nap before the new episode. I’m one of those heretics who couldn’t get into original Who at all; I came in very late (the beginning of the Matt Smith era). I loved New Who immediately, and binge watched from Season One on. Rose ties for favorite Companion with Rory/Amy. I loved, loved the timey wimey twistiness of the Amy Pond saga, with the multiple universes, death and rebirth of universes, and the revelation of River Song. Clara never did it for me. I like the actress just fine – loved her as the Dalek – but was put off by the retcon to make her The Most Important Companion EVER. I stopped watching soon after Capaldi came on; just lost interest. Which is a shame, because I’ve heard great things about Capaldi’s Doctor. Leila was my favourite Who companion. Martha could have been good but RTD character arc for her sucked. I was never a fan of Rose. Being an old Whovian, the obvious romance seemed very out of place to my mind and despite the early Micky not being the best, her dumping of him really wrankled. One reason why I liked Donna was the difference in her attitude to Rose and Martha. It was a breath of fresh air after the cloying romances that had gone before. And no connections to Earth: no mums, boyfriends, magic cell phones that let them call home – in fact, I’d love to just drop a spanner in the TARDIS’s navigation systems and go back to it being random/directed by the TARDIS itself. Well, saw it with wife, ex-fan, we don’t know why we bothered. The latest episode is awful. Not an ounce of humor in it. And they don’t give Coleman much to do. They need a gang of new writers. Or maybe just make a new TV show. I would have watched a show about Rose and her mother, that’s how much I liked her/them. I’d watch a spin off in which Jackie Tyler and Wilf (Donna’s granddad) solve mysteries. @Buwaya: “Not an ounce of humor”? I must have been imagining the several times my wife and I laughed out loud then. I suppose you are just trolling here. As for NuWho companions, maybe I’m not critical enough but I’ve liked them all. I look forward to seeing what the new one’s story will be. I defy any Who fan to watch “Turn Left” and not be amazed by Donna and what she does for the Doctor. That, for me, is the clincher that raises her to the top of the list. Once they switched from Matt Smith to Peter Capaldi, removed anything romantic, and gave Clara a life outside the Tardis, the dynamic really evened up in an awesome way (and “Listen” is a marvelous episode that cements the deal). I’m really liking season 8 so far. Yeah, Moffat could screw it up at the end, but here’s hoping? Freema Agyeman did her best with an underwritten and ill-used character. Best one-off companion (aside from Mme. Vastra and Jax and co): Astrid Penith (Kyle Minogue!) in “Voyage of the Damned,” an underrated companion in an underrated episode. GREG, SECRETLY POSTING ON FILE770 BECAUSE HE’S DONE WRITING OUTLINE FOR THE NIGHT. STILL HASN’T GONE BACK ON FACEBOOK OR TWITTER. ONLY FILE770 IS WORTHY OF BREAKING THE SOCIAL-MEDIA-FAST. Yeah, Wilf was absolutely wonderful. I’d love to just drop a spanner in the TARDIS’s navigation systems and go back to it being random/directed by the TARDIS itself. We all recognize that Wilfred Mott ( anagram of “Timelord FTW”) is the Doctor’s father passed through a Chameleon Arch, right? Lela and Ace were my favorites, with Sara Jane, Adric, and Jaime a close second. Romana is a special case because she was also a Time Lord, so hard to say she was *really* a companion (YMMV).